It's almost turkey time! 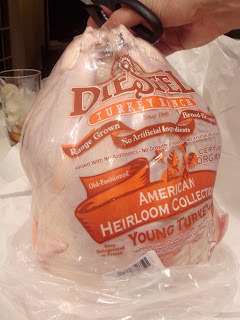 We've already pre-ordered two Diestel American Heirloom turkeys for this year. We thought we'd share some tips for safe turkey preparation since you probably haven't cooked a turkey since last Thanksgiving (we haven't either). How do you safely thaw a turkey for Thanksgiving? Never thaw a turkey "on the counter." When uncooked turkeys are frozen or in the refrigerator, any bacteria that could have been present cannot grow. However, as a turkey thaws on the counter, parts of the turkey that are thawing can get to temperatures between 40F and 140F, which is called the Danger Zone, where bacteria that can cause foodborne illness can grow. • in the refrigerator- Allow 1 day for every 5 pounds of turkey to thaw in the refrigerator. This means several days to thaw. • in cold water (we like this method best)- Keeping the turkey in its airtight packaging or leak-proof bag, submerge the turkey in cold water. Change the water every 30 minutes until thawed. This usually means several hours to thaw. • in the microwave. This doesn't seem like a good idea to us because often areas start to cook slightly. The USDA says turkeys that are thawed in the microwave should be cooked immediately because the partially cooked areas could foster bacterial growth. Here's a link to some cold water thawing and refrigerator time charts - to estimate how long it will take you to thaw your turkey based on weight.